This Hacker News complaint about JustFab scamming a user’s girlfriend — which gets resubmitted whenever JustFab raises money — is a little off, because JustFab is not a scam in the traditional sense. 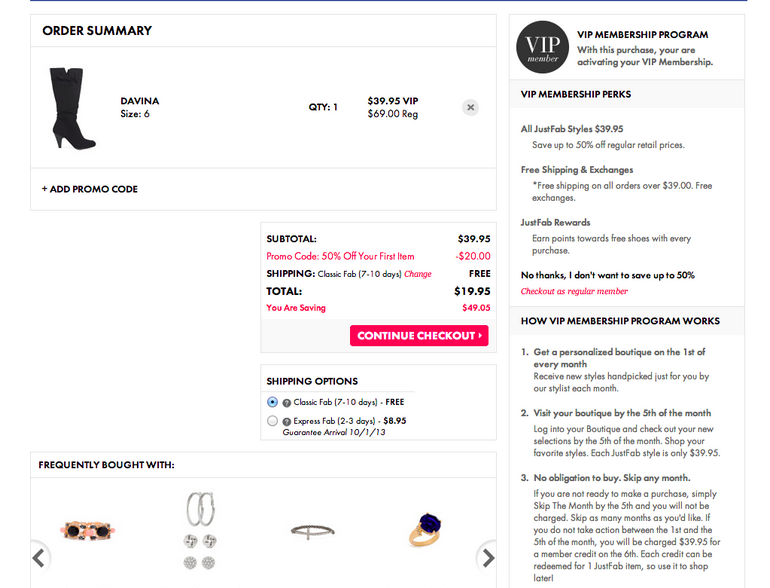 The company is, however, abusing a tricky UI, loaded with dark pattern design gimmicks like forced continuity and sneak into basket — all in the name of getting customers to sign up for a JustFab VIP membership they may not have wanted. Used at least lightly by many e-commerce sites, dark patterns are ways web designers use the irrationality and laziness of any given human in order to increase the bottom line. Many argue that they’re unethical. In fact, the EU has passed a mandate that its countries push through laws protecting consumers from misleading subscription interfaces, which Germany was the first to enact. 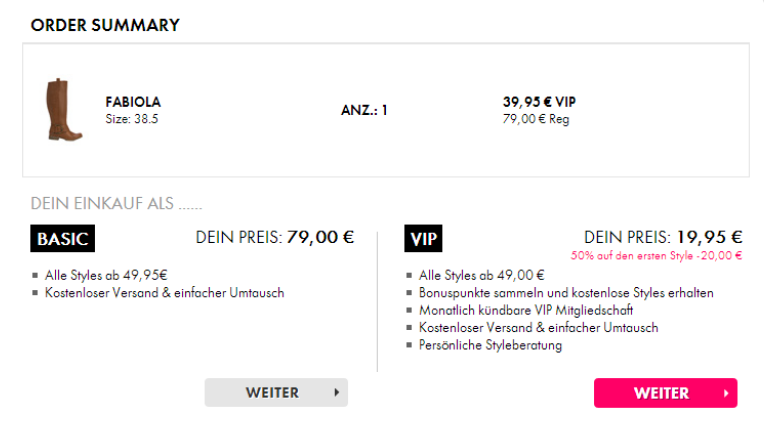 It’s pretty damning that the JustFab checkout looks like this in Germany. And this in the U.S.
Not wanting to just take Hacker News’ word for it, I used my Aol credit card to buy a pair of shoes on JustFab earlier today, trying as hard as I could to avoid becoming a VIP member. The site makes you “check out as a regular member” if you want to avoid VIP, and that link is positioned to the right of the shopping basket in small, lighter-colored typeface. Not an accident. When I finally maneuvered to a place where I could pay the full, non-member price for a pair of shoes, JustFab gave me this sneaky terms and conditions language: “I accept the terms of the Just Fab VIP Membership Program!” and a small check box. Checking the box, which surreptitiously looks like a normal Terms and Conditions box, would sign me up for a VIP membership at checkout, something I purposefully was trying to avoid! Even if you do check the box, it’s not clear that you’ve signed up for a VIP account. This makes it very confusing, especially since you have to sign back in to skip a month. And know you’re subscribed in order to make the phone call needed to cancel your VIP membership. While I successfully managed to avoid becoming a VIP member, users who aren’t tech reporters might have a more difficult time doing so. And that’s a problem, even if those users are “a tiny minority.” For what it’s worth, comments on the site’s Facebook page are generally positive about the brand, though there are a few complaints. I later ran a second test, where I intentionally signed up for membership so that I could see how easy it would be to cancel the subscription. TechCrunch editorial assistant Greg Barto described the process of canceling VIP membership over the phone as a “2” on the 1-10 scale of difficulty, though you have to remember to call. Unfortunately, I cannot cancel my orders of the Anitra and the Tami flats until I physically receive the items. If all this “information is quite clear on the site,” as investor Josh Hannah points out in the Hacker News comments thread, then why did JustFab have to change its interface for Germany’s consumer protection strictures, as shown above? Because it’s remarkably easy to forget to log in every month to “skip” a committed buying period, or make a phone call to cancel, and JustFab knows it. When does a convoluted user interface become outright manipulative? Should consumers either resolve to be intelligent and hyper-vigilant about the dark patterns among us, or avoid “too good to be true” online offers altogether? Perhaps the best plan is to forever shy away from all forms of e-commerce that include recurring charges? And maybe it’s time for the U.S. and others to enact such laws for e-commerce before TechCrunch writer Steve O’Hear has to pay for Amazon Prime a third time, because he, yet again, forgets to cancel the free trial they give him every Christmas. “We are sorry to hear you weren’t happy with your JustFab experience. We have millions of members and 2 million Facebook fans who love our service. It is our high level of service and fashionable styles that keep our members coming back – in fact we sold over 4 million pairs of shoes to repeat buyers in the past year alone. Customer satisfaction is a priority for us and by offering our VIP members items that would typically cost $60 – $100 retail at $39.95, we are giving our members a great value. VIP members are also not obligated to purchase every month. A member can choose to opt out, or “skip the month” and not purchase nor get billed a monthly credit.